"I make my work with the intention of healing. I aim to provide a moment of time for you to contemplate water, sky, light, color, and the world at both a distance and up close. I intend for the moment or longer periods of observation to be rejuvenating; celebrating what is often ignored around us; and reminding us that there are times to just 'find' our breath, as yoga instructors say, and inhale a bit of beauty. I aim for my work to be a reminder to care for what can be so easily lost in this world around us." Barbara Lee Smith is an artist, writer, educator, lecturer and curator. She has exhibited her work and taught in the United States and Canada, Europe, Mexico, Asia, Australia and New Zealand. She is the author of Celebrating the Stitch, published in 1991 and credited with helping to put contemporary embroidery on the art world map. Her work is in the collection of the Indianapolis Museum of Art, the Racine Art Museum, The Tacoma Art Museum, and the Renwick Gallery, Smithsonian Institution, as well as other corporate and private collections. 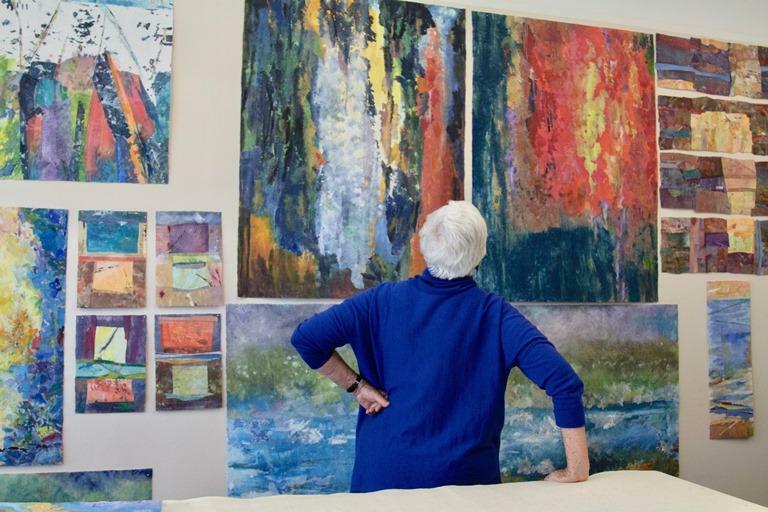 She served for three years on the Board of Trustees of the Bellevue Arts Museum. With an MFA in Mixed Media, she continues to mix it up with paint, collage and machine stitched drawing. She lives and works in Durham, NC.